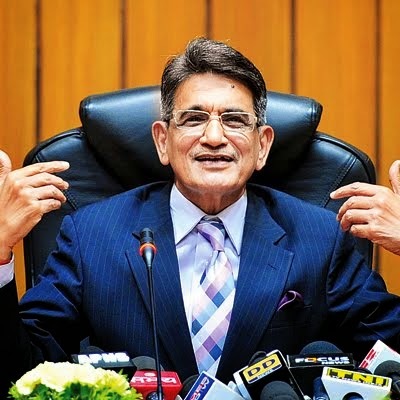 On his last working day in the Supreme Court, Chief Justice of India (CJI) RM Lodha, who recently cancelled 214 coal blocks after holding the allocations illegal, on Friday denied of having received any political ever during his stint as a judge. "You may say it is a divine blessing. In my more than 20 years of experience as a judge of various high courts and Supreme Court, I have not been approached by anybody nor have I received any threat. There was no interference in my administration of justice," said Justice Lodha, who will demit his office on Saturday. The entire experience as head of the highest judicial fora of the country was wonderful and challenging, he added. Justice Lodha, known for speaking his mind, also said retired judges including the CJI from top court and high courts should not take any constitutional or other position at least two years after demitting office. "There should be two years 'cooling off' period before a retired CJI and judges of higher judiciary take up any constitutional post or government assignment," CJI said. However, he clarified that because of requirement of appointments in some tribunals and quasi-judicial bodies, that has to continue unless the Acts or statutes are amended or some other method is to be found. His statement is significant in the light of recent criticism over his predecessor former CJI P Sathasivam's consent to be appointed as governor of Kerala. During his stint in the apex court, Justice Lodha has delivered judgments on death penalty issue, no sanction required for preliminary inquiry of government officials in corruption cases, euthanasia and release of undertrials languishing in jail in petty cases, besides the recent illegal coal block cases. Justice Lodha, who as head of the collegium had recommended the names of eminent lawyers — Rohington F Nariman and UU Lalit for their elevation to bench, strongly defended the collegium system of appointment of judges, saying any other mode (National Judicial Commission) of appointment may impact independence of judiciary. He said judges are best equipped to judge the suitability of candidates before appointment. "I feel and it is my view that if appointment to higher or superior judiciary is made through other institution or body where persons other than judges are involved, it may impact the independence of judiciary." About his differences with the government over the national judicial commission, Justice Lodha said for a strong democratic country like India, strong legislature, strong executive, strong judiciary are required and they should work within their limits and should not encroach others field. Commenting on the instances of sexual harassment involving judges from higher judiciary, he also said, "In an institution like judiciary, such things are not acceptable but different mechanism has been made to address such issues." The lawyers of the Supreme Court also bid farewell to Justice Lodha. Justice HL Dattu, the Chief Justice of India designate, will take oath on Sunday morning.